Iran is using a little-known port of Labuan off the East Malaysia coast to hide millions of barrels of oil from Western sanctions, according to shipping data, industry sources and officials. LABUAN, Malaysia -- Iran is using a little-known port off the East Malaysia coast to hide millions of barrels of oil from Western sanctions, according to shipping data, industry sources and officials. A Reuters examination of shipping movements and interviews shows how Iranian crude is shipped to the area and loaded on to empty vessels at night to await potential Asian buyers. Storing the oil on hired tankers operating under the Panamanian flag in the calm waters off the tax-haven port of Labuan -- an offshore financial center about the size of Manhattan -- means Iran can keep its fleet active and ensure the flow of oil money into its struggling economy. At least two large oil tankers have been unloaded this way in recent weeks and several more Iranian vessels were steaming toward Asia, according to Reuters Freight Fundamentals, which tracks the movement of the global tanker fleet. One was destined for a Chinese port, while three others, carrying as much as 6 million barrels of crude or fuel oil, were sailing to unknown destinations. Iran would like to shift more oil to what is effectively a mobile storage depot off Malaysia's coast over the next few months, said an industry source familiar with Iran's planning who didn't want to be identified due to the sensitivity of the matter. But it is struggling to find shipowners willing to offer vessels for storage. While not illegal, the dead-of-night transfer of oil in the South China Sea illustrates the lengths to which Iran will go to keep exporting its oil to skirt Western sanctions aimed at pressuring Tehran's suspected pursuit of nuclear weapons. A European Union oil embargo has virtually halted access around the world to insurance for Iranian crude and oil products. Doing business with Iran's oil industry carries reputational and financial risk and the threat of losing insurance coverage. Less than 6.2 miles from the coast of Borneo, Labuan is sheltered from typhoons and is typically used to park unwanted ships rather than store expensive oil. People in the industry say this makes it an ideal place to blend or rebrand oil as non-Iranian and resell it under the radar of sanctions enforcers in Washington or Brussels. "Labuan is like a no-man's land. There's no reason to be paying attention to Labuan," said a Singapore-based source familiar with floating storage operations in Southeast Asia. The insurer of one of the storage ships that took oil from an Iranian tanker said it had been informed of the transfer by the British government on Aug. 16, and was looking into the matter. Click to see full-size diagram of how the oil shell game works. With fewer customers, Iran has cut its oil output and almost halved exports from around 2 million barrels per day last year. 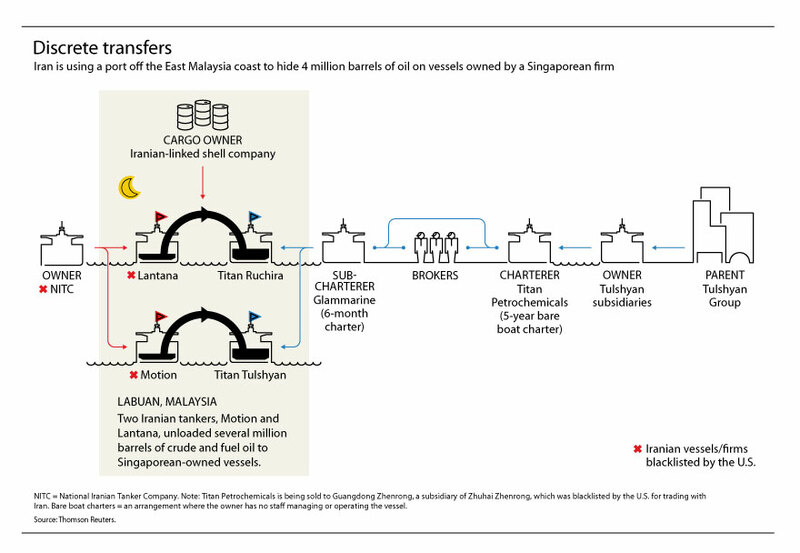 The Labuan scheme means Iran can use its own tankers to move, rather than store, its oil. In April, shipping sources said more than half of Iran's tanker fleet was anchored in the Gulf just holding some 33 million barrels of oil - worth around $3 billion at today's prices. Malaysian and Iranian officials did not respond to requests for comment for this article. China, India, Japan and South Korea, which together buy over half of OPEC member Iran's crude exports, have all imported less this year, winning waivers from U.S. sanctions. Those waivers are up for renewal later this year, so buyers are careful not to be seen to be increasing imports from Iran again. Last month, the Lantana, a tanker operated by the National Iranian Tanker Co. (NITC), transferred its cargo of around 1 million barrels of crude oil to the Titan Ruchira, a floating storage vessel, off the tiny tropical island of Pulau Kuraman near Labuan, port and shipping industry officials said. Around Aug. 10, another Iranian tanker, the Motion, discharged as much as 2 million barrels of fuel oil onto the Titan Tulshyan in the same area, said the officials. The two ships are among 58 Iranian-owned vessels blacklisted by Washington in July for assisting in Iran's oil trade. Those measures bar U.S. companies and Americans from doing business with the ships. "Our vessels are there and, as we understand it, there are no issues," a source familiar with NITC tanker chartering told Reuters. A third NITC tanker, the Justice, had been heading for Labuan, but shipping data shows it changed course and should arrive at the Chinese port of Dalian on Sept. 17. Another tanker, the Pioneer, had been expected in Labuan early this month, but has anchored off the southwest Malaysian coast. "That (Lantana) operation took place literally in the dark of night. They didn't even use a proper operator with experience to carry out the STS (ship-to-ship transfer)," said an East Malaysian-based shipping source. "The authorities were aware only after the fact." Iran declined to sell the stored crude to a Chinese trader who offered $54 a barrel - only around half the price of Iran's cheapest heavy crudes - said a source familiar with those discussions. The two Titan vessels are owned by offshore companies linked to Singapore-based Tulshyan Group, which hired them out in 2010 to Hong Kong-based Titan Petrochemicals under a five-year bare boat charter -- an arrangement where Tulshyan has no staff managing or operating the vessel. Tulshyan, which shares a Singapore office with Titan, said it was not aware that the cargo on its ships was Iranian. Titan, battling a shipping industry downturn caused by a glut of tankers, high bunker fuel prices and a shaky global economy, has struggled to meet charter payments to Tulshyan, according to a person familiar with the matter. Heavy with debt and with five straight years of losses, Titan is being sold to Chinese oil trader Guangdong Zhenrong Energy Co Ltd., whose parent, Zhuhai Zhenrong, is blacklisted by the United States as the biggest supplier of refined petroleum products to Iran. Titan hired out the two tankers to Glammarine, a little-known shipping company that only recently registered in Labuan. Glammarine took the two ships under a six-month charter, with Titan's crews running the vessels' day-to-day operations and Glammarine taking responsibility for finding the cargo and paying for use of the ships. "This was the first business we've done with Glammarine ... (and) there were no red flags raised (about them)," Titan director Augustine Cheong told Reuters in Singapore. "The due diligence we took was to check if they are legally incorporated. And it's on a time charter, so we have our own crew on board and can see if they're doing something wrong." Cheong said Titan would drop the charter to Glammarine if the oil was found to be Iranian. Glammarine officials declined to comment. A visit to a listed Labuan address for Glammarine given in business registry documents found a rundown building in a neighborhood once used to house workers at a now defunct milk factory. The premises were closed. Glammarine agreed to let a company called Account International Safe Oil use the Titan Ruchira and Titan Tulshyan to store 4 million barrels of Iranian oil, shipping sources said. Account International is not registered in Malaysia or Hong Kong, and Reuters was unable to find an address for the company or contact staff for comment. Buyers of Iranian oil in China, India and Japan said they had not heard of the company. A Middle East industry source familiar with the company said Account International was an affiliate of the National Iranian Oil Co. A second source based in East Malaysia said the firm had business links to HK Intertrade, a Hong Kong-based firm sanctioned by the United States in July for operating as a front company for Iran. "HK Intertrade purchases oil from NIOC and resells it to companies like Account," another southeast Asia-based shipping industry source said. The ships' managers from Titan were not aware that the crude and fuel oil transferred from the Lantana and Motion were from Iran, Cheong said. "We requested BL (bill of lading) documents. We were told the cargo was from India ... and we believed they were ex-NITC tankers," he added. "We only operate the ships as the ship manager. We don't own the cargo." A source familiar with the operations of the Titan Ruchira said the cargo was declared as Iranian to port officials in nearby Sabah. Customs officials in Sabah did not respond to Reuters emails. But in signed shipping documents seen by Reuters, Account International listed the 1 million barrels of crude oil unloaded by the Lantana as Indian. India, though, doesn't allow the export of domestically produced crude. Nor did the Lantana call in at India on its journey to Malaysia that began at Iran's crude export hub at Kharg Island, according to Reuters Freight Fundamentals and industry sources in both India and the Middle East. Account International also indicated on shipping documents seen by Reuters that the fuel oil on the Motion was from Fujairah, a major transhipment and storage hub in the United Arab Emirates. Shipping data shows the Motion did stop in Fujairah, but began its trip in Iran. The Titan Ruchira is insured by the North of England P&I Association, which said it was looking into the matter after being informed of the transfer off Labuan by London last month. Western insurers underwrite around 90 percent of the world's tanker fleet, and are currently barred from covering ships carrying Iranian oil. "There is a risk ... a vessel providing storage services for Iranian oil would breach European sanctions laws," said Mike Salthouse, director with North Insurance Management, which acts as manager for the North of England P&I Association. "I say a risk because sanctions as currently drafted appear to target the insurance of the transportation of Iranian oil and not the provision of insurance to facilities storing such products." The insurer declined further comment on its investigations. The Titan Tulsyhan is among some 7,000 vessels covered by Gard, the world's second-largest marine insurer. "Gard takes very seriously any suggestion that it is in breach of any international sanctions and is conducting an investigation," it said in a response to Reuters queries. "Gard can, and will, withdraw any insurance cover if it believes sanctions are being breached." Rakesh Tulshyan, head of the Tulshyan Group that owns the two Titan vessels, said that if there is "concrete evidence that it's Iranian oil", he will seek to have it removed from his vessels. "Because of my reputation, I would rather not do any business with links to sanctioned countries," he told Reuters. 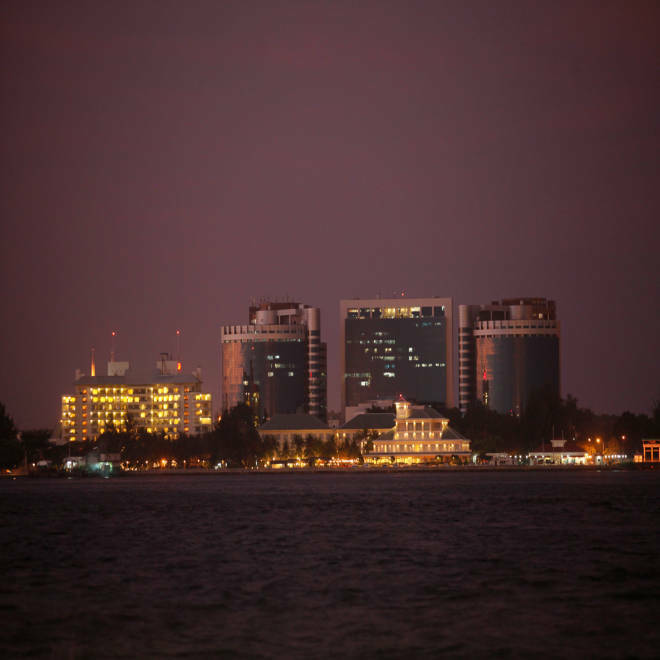 Reporting by Luke Pachymuthu in Labuan, Malaysia; Randy Fabi and Manash Goswami in Singapore, Nidhi Verma in New DelhiI, and Jonathan Saul in London.